← Maker’s — Off the Rocks and Back on the Mark? Behold! The ever-elusive specimen of smart QR code use in its native environment! So there’s lots of talk about QR codes from me lately, eh? Some people have already written them off as useless, some people love them, and some people apparently love to hate them. Like a lot of people, it took me a while to understand what they are and how to use them, but now I’m impressed with QR codes’ potential for quickly linking the tangible with the digital. But as we are all painfully aware, slapping QR codes on everything willy-nilly is not good strategy; it’s a mistake. As a humongous marketing nerd I get inordinately excited when I see unique applications of marketing technology or principles. 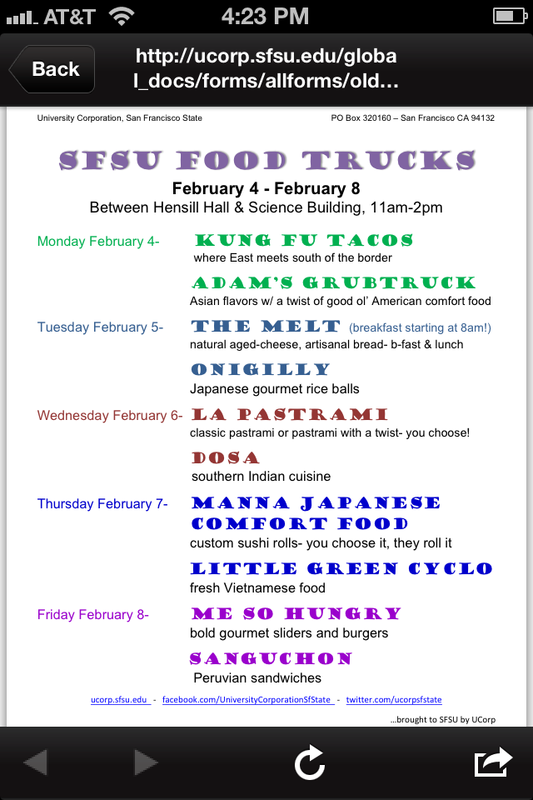 So suffice it to say, I stopped dead in my tracks and gasped aloud when I saw this campaign to promote the food trucks that visit the SF State campus daily. I think the planners demonstrate refined use of the much-maligned QR code, for the most part. The campaign definitely highlights best practices for leveraging QR codes to solve both marketers’ and consumers’ problems. And indeed, these are best practices you might remember from Marketing 101. Always think in terms of consumer benefit — and make it explicit in the call to action. The unique situation with the food trucks at SF State is that they are tucked away between two buildings a bit off the beaten path. It’s a great spot, but it’s completely feasible that students could spend a semester at school and never know they’re there, much less what kind of foods they offer. Like most food truck scenes, the trucks rotate daily. 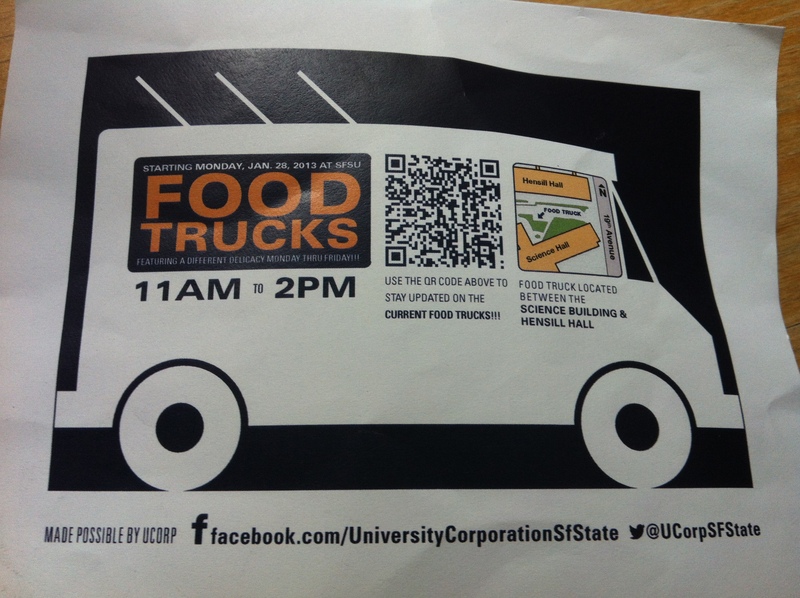 People in the SF State community might not know they have the trucks as a lunch option without this campaign to generate awareness. With a quick scan of the QR code on these print materials, consumers receive a list of the trucks for the week, along with a short description of the food they offer. And of course the map is right there as well. We see the QR code in this campaign helps solve the consumer’s problem (I’m hungry, so what should I eat for lunch today) and the marketer’s problem (how can we get the trucks into the diner’s consideration set). Place print materials strategically to meet consumers’ needs when they arise. The top image in this post is the postcard-sized version, which is available at the convenience store in the Student Center. Also brilliant! Someone who is grabbing a snack will likely be interested in a quick bite from a food truck as well. Of course the print materials only go so far. 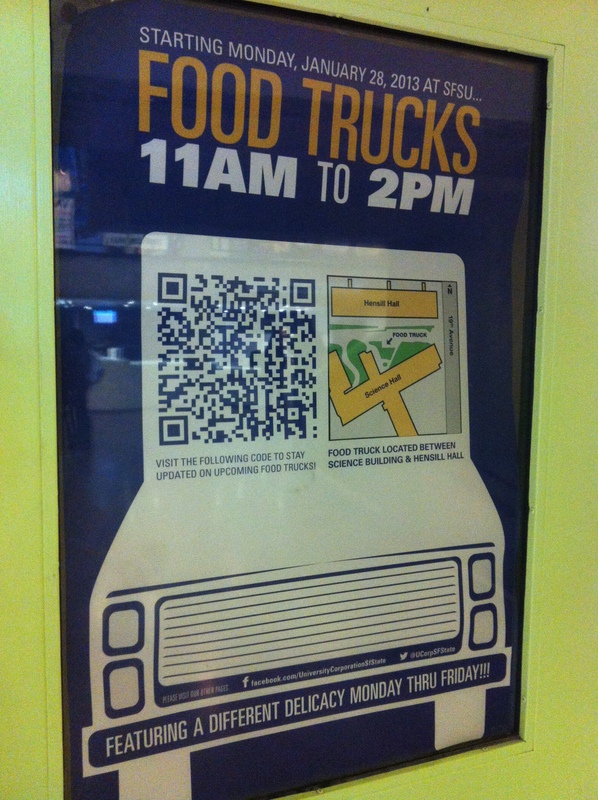 The QR code links to dynamic but vital content — a list of trucks on site each day and what they serve. The call to action announces the benefit of using the code. Interestingly, I see a lot of QR codes without a call to action. Not even “scan here!” Again, the code provides a bridge to dynamic digital content and solves a consumer problem (I want to know what trucks are over there but I want to know immediately without walking) and a marketing problem (how do we promote the selection of trucks for the week). Link to content that is useful and optimized for the appropriate device. This seems like a no-brainer, but there is much exhibition on the internet about how marketers link QR codes to big flashy web sites or content that doesn’t make sense. If someone is scanning a QR code, clearly they are on a mobile device. So take heed of that fact and make sure the content on the other end makes sense and is optimized for mobile viewing. The code in this campaign goes to the .pdf format page pictured below, which seems to work fine on my iPhone, but it’s likely that it wouldn’t on others. Here, the campaign could use a bit of adjustment by linking to a tested mobile web page proven to work well on all devices, if possible. Draw ’em in with design. I had to mention this, because I am enamored with the design of this campaign. I get so tired of seeing QR codes jutting out of posters — I really appreciate the integration of the code into the image. It catches my attention and increases the likelihood that I will make the jump to scanning. What do you think of the QR code in this campaign? How would you improve it? I’m going to be brave and give it a B-! Have to admit, qr code is powerful. My friends and I established a small company. Although our company is small, we still introduced qr code software to help our business. It’s worth trying.